Co-ordinator of Sustainable Wales, Margaret Minhinnick, says: “The Elvis festival weekend is now well-established. This extraordinary eisteddfod is unignorable in the town, so our charity is making a contribution to the fun. “ Peter Finch will be sharp! And our popular Open Mike will include film and photographs, drawn from the history of Elvis in Porthcawl. Dydd Gŵyl Dewi Hapus! 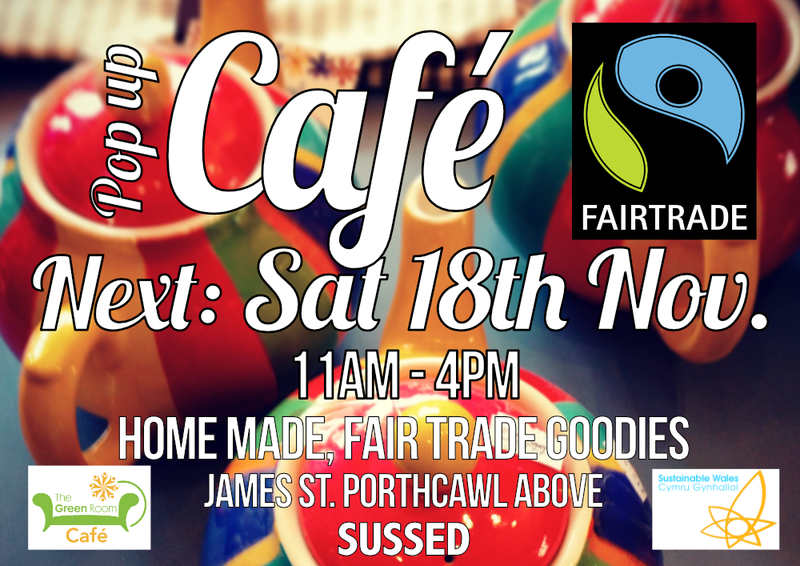 We're following a St David's Day theme with the latest pop up fairtrade Café above SUSSED. Menu and details will be posted on our facebook page so don't forget to follow us there! The video performance promises a musical and poetic dramatisation of an incident in recent history. 27TH JAN, The Green Room, above SUSSED. The SUSSED shop will be open with a range of ethical Christmas gifts. Don’t forget members get 10% off (excluding local crafts, eco and food)… not a member yet? Sign up for membership on the night for an exclusive £8 (normally £12) and use your 10% member discount straight away! 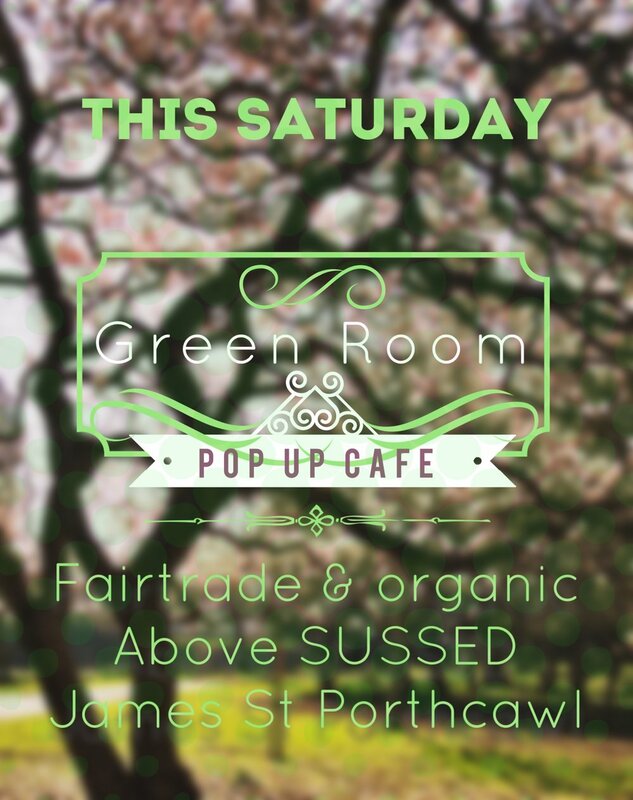 Visit the Green Room POP-UP Café 3rd Sat of the month. An evening of readings, live music and images from Gerry Rae. A welcome return for Rhian Edwards to the Green Room. Bridgend County Fairtrade Partnership is holding a Fairtrade Festival including a ‘Bake-Off’ at Carnegie House, Wyndham Street, Bridgend on Saturday 18th March from 11 a.m. to 3 p.m. This is a family event and there will be Fairtrade stalls, coffee bar, stalls, story-telling music, films etc. Find out more at the dedicated page on the Sustainable Wales website. Free Discussion: What is Sustainability? How can we make it part of our culture? 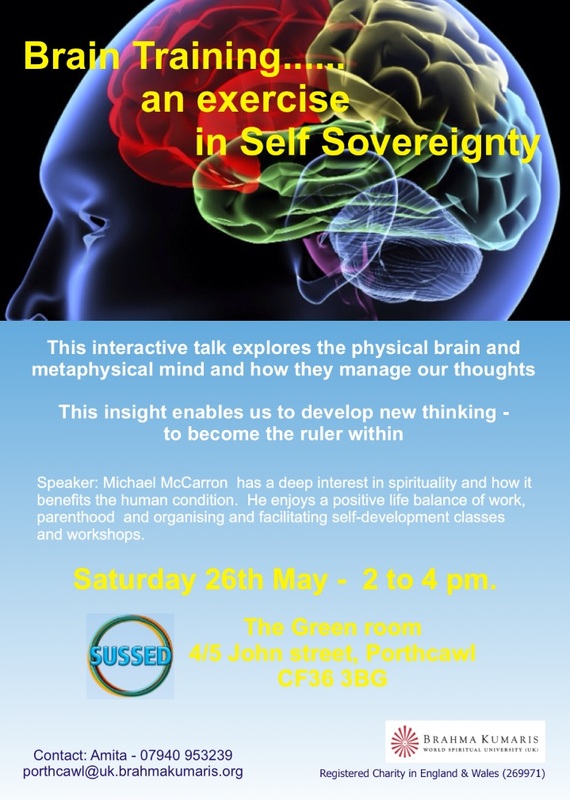 The first of a new series of talks and debates at the Green Room above SUSSED 'What is Sustainability and how do we make it part of our culture?'. These are planned for the second Friday of the month (orange posters). The sub questions will be along the lines of belonging and culture and how mainstream culture seems to be based on using consumerism as a way to belong, which in turn may make it a difficult thing to let go of. So how do we link sustainability with belonging, on a local level as well as a global level? And how do we appeal to people who may see becoming 'eco' as moving away from their traditional communities? BYOB, Free but donations are welcome. Some refreshments will be available from our fairtrade range of teas and coffees. Please share this on social media. More events planned for the Green Room this year so check our twitter, these event pages etc. One Time Alive, following the release of their albums Sugar Train and Five Star Vending Machine return to the Green Room for an evening gig with old and new material. The latest album is available at SUSSED. 8pm. Friday, February 24 sees the return of the charity, Sustainable Wales’s Green Room after a winter break. First performance will be poet, MIKE JENKINS, a widely published writer who has won Wales ‘Book of the Year’ and edited the international quarterly, ‘Poetry Wales’. Mike is celebrated for his radical political views, but his poetry is wide ranging and original. Often it reflects his life spent as a teacher in comprehensive schools in south Wales. Well known also as an opponent of opencast mining, which he sees as a blight on his local landscape in Merthyr Tydfil, Mike Jenkins has also recently began to write in Welsh. Joining Mike will be fellow poet MIKE CHURCH, and there will be opportunities for local writers to join in the Open Mic, always a popular Green Room feature. The Green Room will diversify in 2017, with a series of music events and discussions. Entrance £4. Everyone welcome. The charity does not have an alcohol license, thus the public are urged to bring their own. The latest books by Mike Jenkins and Mike Church will be on sale on the night. 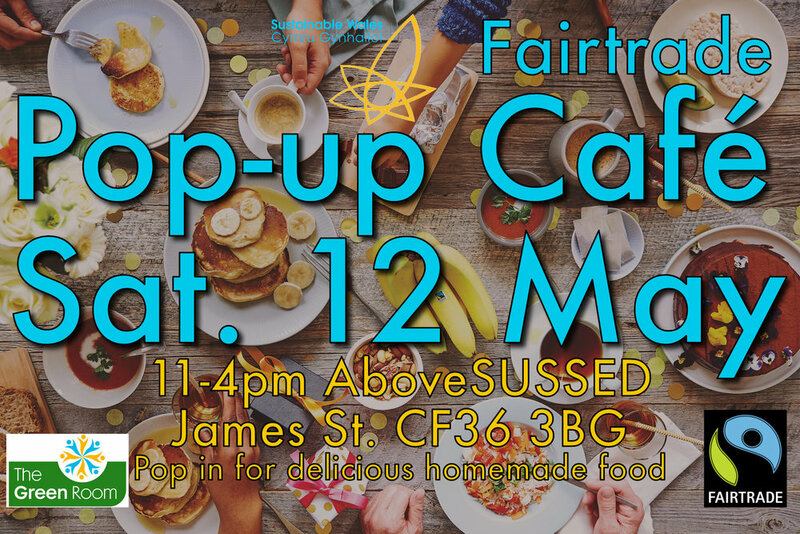 The pop up Café returns with delicious home made food and fair trade coffee, teas etc. The pop up Green Room Cafe returns on 17th December. Call in for some delicious home made goodies.